I get the idea, and I understand the appeal of gambling on which collectible figure you'll find in the box, but would you be happy parting with £7 to randomly receive a small vinyl plastic caricature non-action figure (only the head moved on the one I received)? Each figure is approximately 7 cm tall and comes sealed in a mini black opaque bag, which is inside a box, which is wrapped in cellophane. My biggest problem with this is that it is next to impossible to get into the box without destroying it. So, if you wanted to keep your box to put the figure back in if you have a duplicate you want to swap with someone... well, you can't. 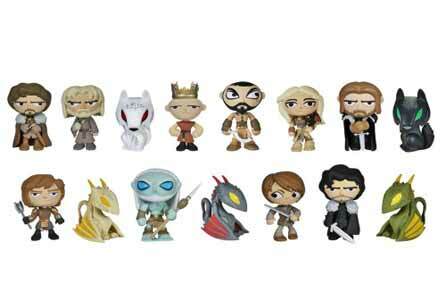 The vinyl figures in the "edition 1" range include Tyrion Lannister, Joffrey Baratheon, Jon Snow, Daenerys Targaryen, Khal Drogo, Drogon, Viserion, Rhaegal, Arya Stark, Robb Stark, Ned Stark, Jaime Lannister, The King Whitewalker, Ghost, and Shaggydog. There are 16 figures in total to collect, but not all are so easy to obtain. The box shows each figure and the chances of finding one. The most common figures you have a 2/24 chance of finding, but for the rarest two figures you have a 1/144 likelihood of discovering it each of them. 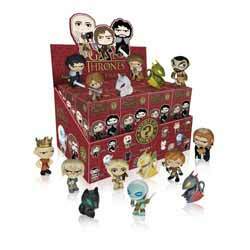 While they are fun items for Game of Thrones fans, to collect the entire set will set you back a small fortune and result in you owning a lot of the same figure.